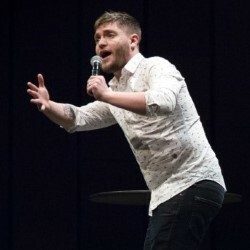 Liam Withnail (2018 Amused Moose Comedy Award Nominee) is very well-known in the Scottish comedy community outside of the Festival, but how does his new show Homeboy rate with an Edinburgh audience in August? The answer is well, and is in fact one of my most exciting recommendations this year. Homeboy is an hour of stand up, delivered in Monkey Barrel 2 (which outside of the Festival is a Harry Potter themed escape room). The dark underground venue has the feel of a proper rock show, and Liam Withnail brightens the place up with his outstanding funnies and upbeat personality. Liam’s previous shows have been based on his own personal big events, but this year Liam confessed that not a lot has happened. Instead, he takes on some big issues and themes, and puts his views and perspective across in delicate but very funny way. Liam’s experiences and views are so on point, and delivered in a way that brings the whole audience together and keeps them on his side. His jokes and narratives are brilliant, proving his humour is very worthy of the Award Nomination he has received from Amused Moose. Catch Liam Withnail: Homeboy at 5pm at Monkey Barrel throughout August. The show is Pay What You’d Like, but we recommend you get a ticket in advance to ensure entry.